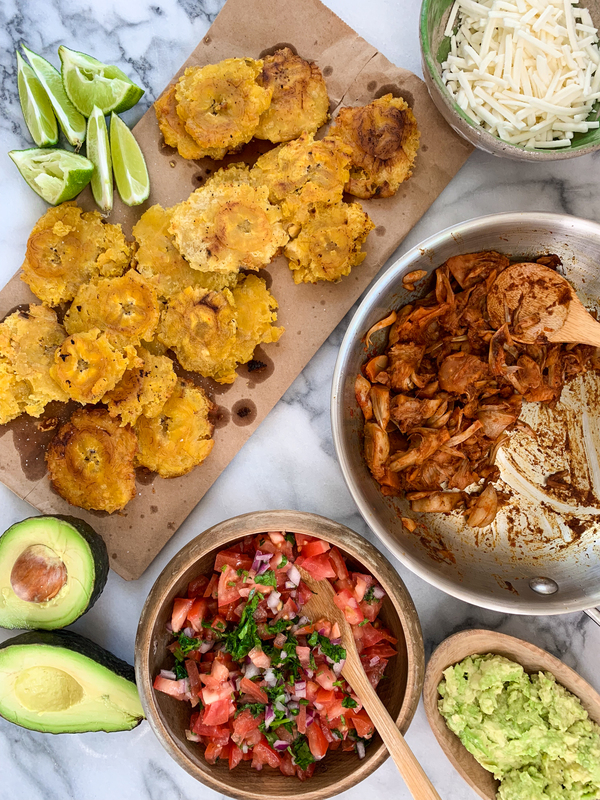 Jackfruit Tostones (Plantain) Nachos - plant based! 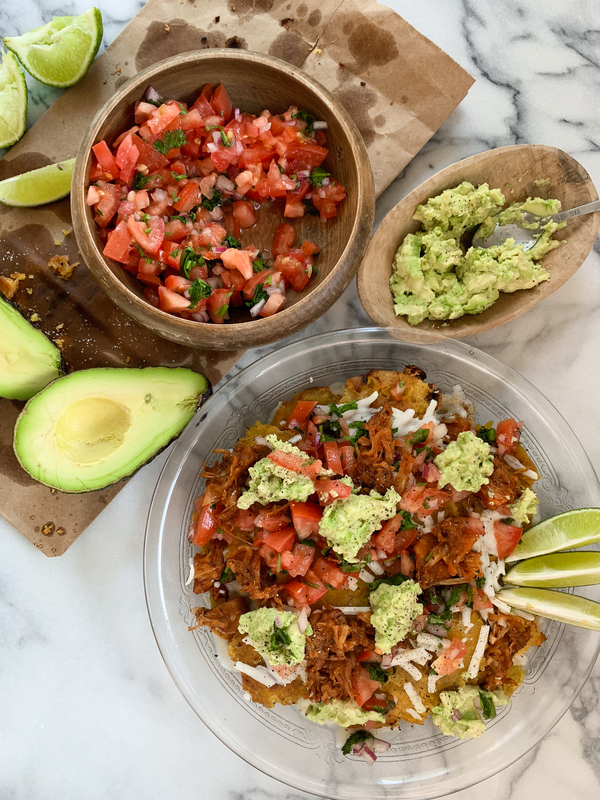 These Jackfruit Tostones Nachos are a plant based, Latin version of traditional nachos – made with crispy plantains, pico de gallo, guacamole, melted cheese, and a spiced up jackfruit that is sure to convince anyone to go vegan for a meal! It’s my first post of 2019 and I wanted to share a delicious, plant-based recipe to start the year because I want to set the tone for what I would like 2019 to look like. And that’s more delicious food that focuses on flavorful vegetarian and vegan meals. A lofty resolution I’m sure many of us have made but one that is easy to follow because: NACHOS! 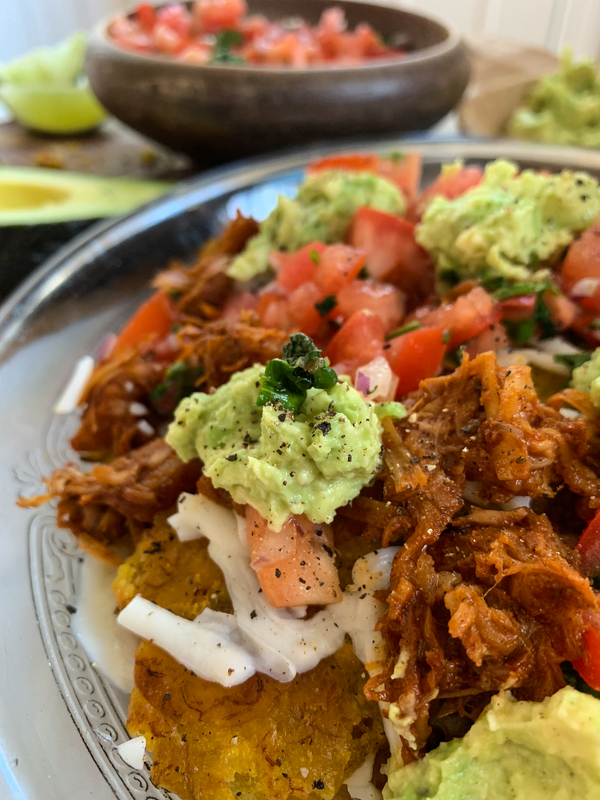 You can eat nachos and sure they might not be the best option for everyday, but these Jackfruit Tostones Nachos are my favorite weekend snack to have! First, let’s talk about tostones. They are twice-fried green plantains. Sounds indulgent, right? But when you shallow fry in coconut oil, things stay healthy in my opinion. They are a traditional snack in the Dominican Republic and typically consumed as a side dish to our rice & bean lunches. There’s nothing really I can compare it to, because they are thicker than a potato chip and have a distinct texture that makes them the perfect base for these nachos. Why do you need to twice-fry plantains for tostones? The process of double-frying plantains might sound odd, but I promise it’s a must when making tostones. You’re going to peel and cut the plantain into 1” rounds, fry those and then smash them! Yes, smash them with the bottom of your favorite coffee mug or your husband’s beer glass or whatever you have around to smash these. Once smashed, throw them back in the frying pan for a few minutes to get crispy. Note: these are NOT cooked after the first frying, thus you must do the second frying. If you don’t, you’ll eat raw plantains and that’s not very delicious. You’ll make the pico de gallo and the guacamole with simple ingredients, or you can make your favorite version of each. Below I’ve included some variations for these classic Mexican condiments that would also work well. Instead of cilantro, add mint to the pico de gallo for a subtle different flavor. Play with other herbs or a mix of herbs for extra deliciousness! You’ll note in the recipe below I used a variety of store-bought products that I’ll link below and share more about, but this isn’t a sponsored post. As blogger, we get complimentary samples and after I try them, I like to share them with you if they deliver on value, mission, and flavor and these three following brands do that and more, so make sure to show them some love. Upton’s Naturals’ Jackfruit – an independently owned natural foods company with a focus on meat alternatives and vegan values since 2006. I love that they are dedicated to simplicity and the use of real, recognizable ingredients, plus this prepared jackfruit really makes my life easier when I want a quick meal because preparing jackfruit from fresh takes a LONG TIME, so I appreciate them doing the hard work for me. It comes in a variety of flavors and you can find it in most grocery stores. GOOD PLANet FOODS – let me start by saying that this vegan cheese is one of the BEST, if not the best vegan cheese I’ve ever tasted. The company offers plant-based, dairy-free cheeses made from gluten-free, allergen-free, and non-GMO ingredients! The way this cheese melts is INSANE – sooo cheesy and delicious! Salsaology Authentic Mexican Salsas – a line of cooking sauces inspired by the regional flavors and ingredients of Mexico, they bring bold and exciting Mexican flavors to your kitchen easily! 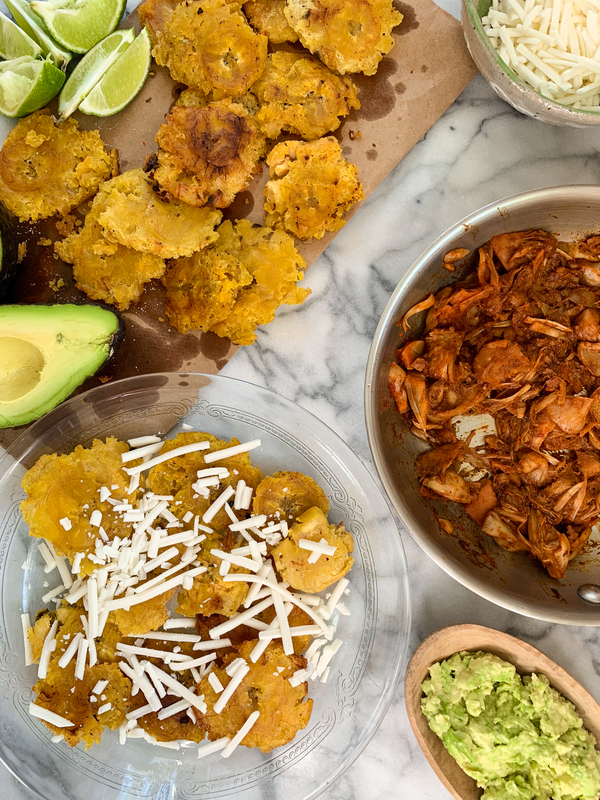 Here’s the thing – I love Mexican cuisine but can’t ever recreate those flavors at home because Mexican cuisine is INSANE when it comes to the amount of ingredients and techniques used. So when I received these sauces from Salsaology, it was a gift from the flavor gods because these sauces are so brightly flavored that they make everything I use them in delicious. For this recipe, I used their Ancho Chile & Tamarind Sauce and it was perfect with the jackfruit. The sauces are sold online and a little goes a long way! I hope your new year is off to a great start – and if you make these nachos, make sure to tag me on Instagram at @marnely_murray so I can see it! 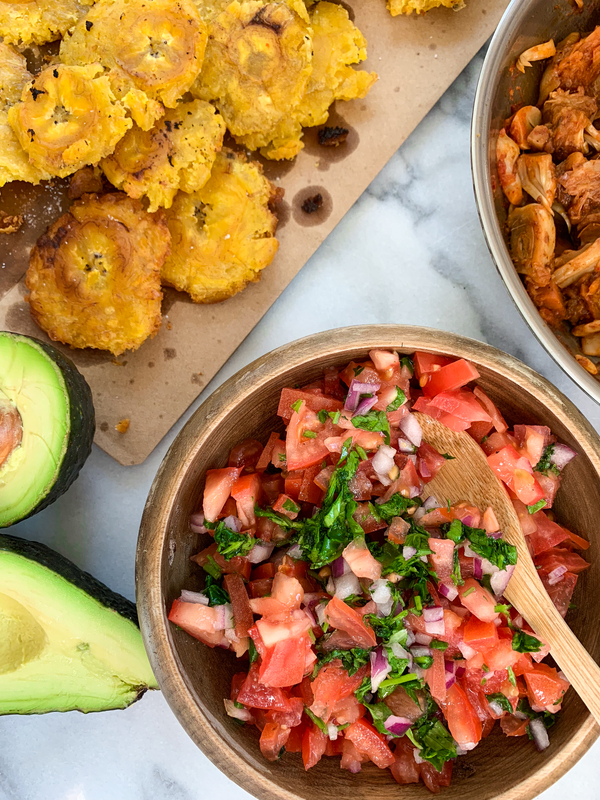 These Jackfruit Tostones Nachos are one of the best versions of nachos you'll ever encounter: crispy plantains, melted vegan cheese, spiced up jackfruit, pico de gallo, and guacamole - all you need for the perfect meal or snack with friends! *Note: If you can't find this specific sauce, you can either use a flavored jackfruit or just add one canned, chopped chipotle pepper to the jackfruit for extra flavor.